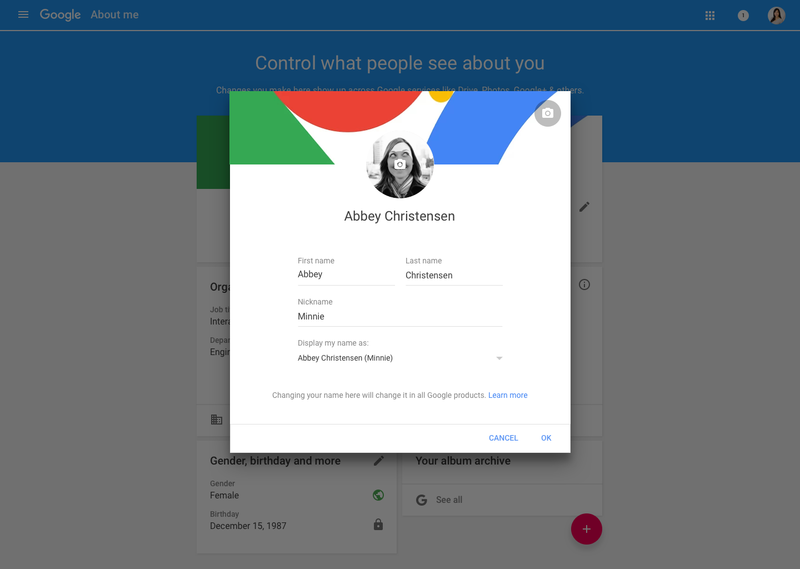 On June 26, 2017, we’re releasing some changes that will bring user profile management under the direct control of G Suite admins, starting with the Name, Photo, Gender, and Birthday fields. 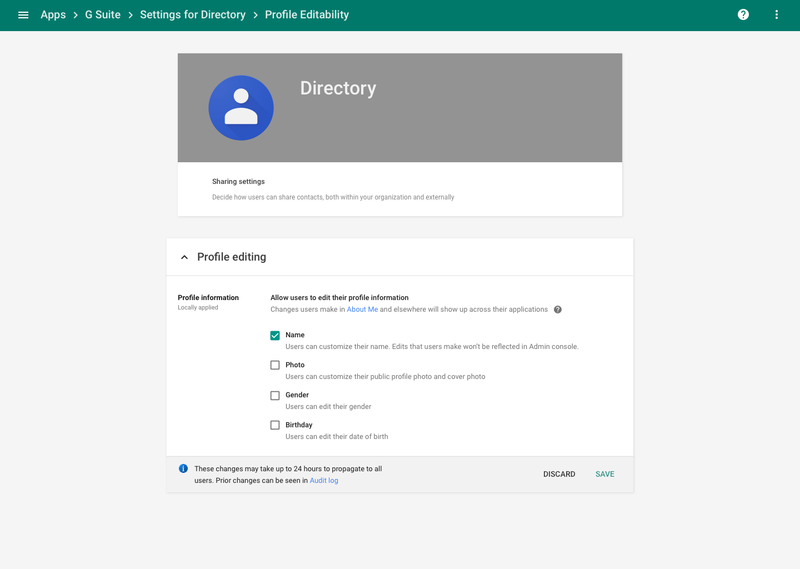 Whereas end users could previously only edit these fields if they had upgraded to Google+, these new controls let admins decide which profile fields can be edited by end users, independent of Google+ status. Additionally, we are renaming the Contacts setting to Directory in order to better describe the functionality and, as such, the Contacts on/off setting within it will be removed. If you want to enable or disable your users’ ability to modify their Name, Photo, Gender, or Birthday, you can now do so from the Admin console. You will continue to be able to set these fields directly yourself where supported in the Admin console, or sync values using Google Cloud Directory Sync. Profile editability can be toggled for your entire domain or by organizational unit (OU). Editability settings are respected across Google. Once editability is enabled, your users can modify their profile information from My Account, About Me or other surfaces where profile editing is supported. If editing is disabled, users will be directed to you, the administrator, if they need to make changes. This is the first in several launches that will grant admins better control over the editability of user profile data. Stay tuned for additional profile, directory, and contact management improvements in the future. Service setting for Contacts On/Off: As part of this launch, we are removing the Contacts service on/off setting from the Admin console starting on June 26, 2017. Today, this setting only controls access to the Web contacts manager at contacts.google.com. It does not control any other user access to contacts, such as the contacts manager in Gmail, the Contacts Preview, API access to contacts, or the Directory functionality. Once the Contacts on/off setting is removed from the Admin console, we will retain the the Web contacts manager on/off preference you’ve already specified. Please review whether this setting needs to be changed, and if so, make such change in the admin console before June 26, 2017 if required. You can review your own Admin console settings from the Admin console. When Contacts Preview eventually replaces the current Web contacts manager, the setting will no longer have any effect, and will be fully deprecated. Default editability settings: At launch, editability behavior will be consistent with pre-launch behavior. 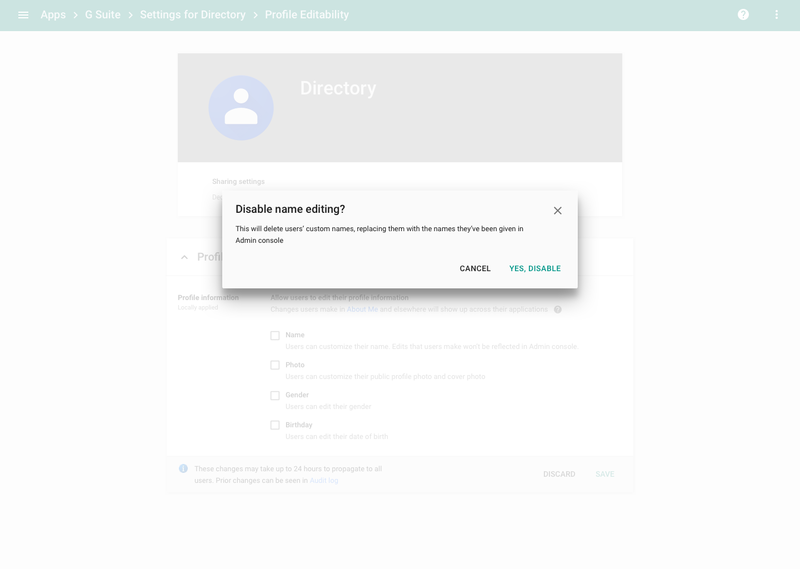 For example, if Google+ was disabled for an Organizational Unit, which restricted editing pre-launch, then your editability settings will be “off”, not allowing users to edit their name, gender, photo, or birthdate. For domains with Google+ enabled, we will respect and migrate over the name editability control that existed in the Google+ settings. This design choice was made to keep the impact to your domain minimal, giving you flexibility for when you’d like to make changes. Name editing disabled. Other fields enabled. Birthdate editing enabled. Other fields disabled. Special behavior for Education domains: Education domains will not have an editability control for birthdate. For those domains, birthdate will never be editable by end users, except in the Google+ upgrade flow, if Google+ has been enabled. Special behavior for domains with existing profile photos: Some domains have users with profile photos, despite not having G+ enabled. Those domains will have photo editability enabled on launch, in order to not interfere with existing photos. Admins may change the setting after launch. Update 6/26: This rollout is being rescheduled to late July in order to further improve the speed of account profile updates. Apologies for any inconvenience this might have caused you. We will update this blog post once it's live. Please continue to monitor the What's New calendar for updates.